BoB writes, "NF sent me “School for Scoundrels” on Wednesday, 4/19 from my local DC. We received it and watched it Thursday night and sent it back on Friday, 4/20. Today (Saturday 4/21) I received another copy of it from Bedford Park, IL." Has anyone else had a double shipment of movies from Netflix? The Exeter Library in Rhode Island has subscribed to Netflix, and if they don't have a movie in stock you can request that they rent it for you. The Library has subscribed to Netflix, the online movie rental service. Now, if there is a title you are looking for that isn't on our shelves or the shelves of any other RI library, you can request that we get it through Netflix for you. This is a great way to view the popular movies that are always out, as well as the documentaries, foreign films, and television series that aren't available at the local libraries. It's also a great way for us to provide the materials you want, without having to purchase several copies of the same title. How it works: you place a paper or e-mail request with us. If the title is not readily available through the regular library delivery system, we will go into our Netflix account and order it for you. When the movie arrives, we will notify you and you can check it out for one week with your library card - just like the movies we own. Depending on how popular the service become, your DVDs should arrive very quickly. Click here for the full list of new releases this week (142). Interesting movies include The Queen, Deja Vu, Night at the Museum, Code Name: The Cleaner, Wanderlust, Crude Awakening: The Oil Crash, Thr3e, 10 Items or Less, The Lost Tomb of Jesus, Planet Earth: The Complete Collection, Author! Author!, Kidnapped: The Complete Series, Tsunami: The Aftermath, Starbucking, The Drew Carey Show: Season 1, and The True Story of Che Guevera. Wal-Mart $299 High-Def DVD Player This Year? Engadget is reporting that Wal-Mart will offer a $299 high-def DVD player this year (they're not sure if the translation is HD or Blu-ray). At what price will you buy a high-def DVD player? Satya writes, "I rent some Indian DVDs from Netflix, and often they don't play on my hardware DVD player. I pop the DVD in, it spins up like normal, and I get a black screen. This has to be cleared by power-cycling the player. This seems to only happen on Indian DVDs. I have not seen a correlation with which distributor manifests the problem, but the last one this happened to was distributed by Venus. This may be a PAL versus NTSC problem. Is Netflix specifying that they want NTSC discs? They will play fine on Windows XP. Has anyone else had a similar problem? Could it be the DVD player or the movies? Nevertheless, there must be more time-starved parents like me who would rather order the movie on demand and not bother with getting in the car or thinking a week in advance about what they want to see next Saturday night. A recent report by Plunkett Research cites Leichman Research Group's findings that 65% of cable subscribers watched video on demand in 2006, twice the number from the previous year. This is a trend on the move. In December 2006, Comcast customers watched 25 million free on-demand movies, according to a company representative. Media and technology market research firm isuppli estimates $2 billion worth of on-demand was spent in 2006. Not all of the $2 billion was spent on movies. According to isuppli's Mark Kirstein, a good chunk of that was sports entertainment such as boxing and wrestling pay-per-views, though movies were also a significant portion of the figure. Brainyartist on CollegeConfidential is using Netflix to prepare for the AP World and US History tests. The list of recommended movies? Have you used Netflix as an educational resource? It was probably just a coincidence, but TMZ is reporting that Netflix featured the movie Oldboy, which might have been an influence for Virginia Tech killer Cho Seung-Hui. Two TMZ staffers logged into their Netflix "suggestions page" this morning -- both often rent foreign films -- and the top suggestion surprisingly came back as the super violent South Korean revenge flick, "Oldboy." According to several published reports, one of the photos in the killer's now infamous press kit bore a striking resemblance to a key image in the film. 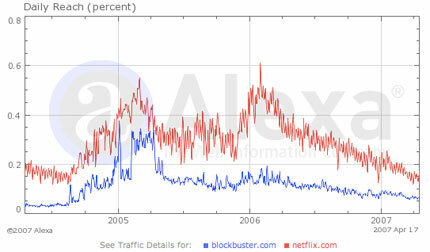 How can Blockbuster Online be growing so quickly without a huge spike in website traffic?